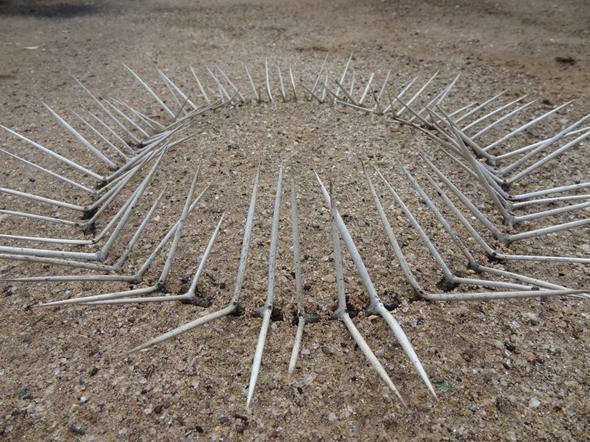 I am hard at work preparing for a land art project which I am planning to do at the coast soon, and have been spending much time finding and cutting white thorns. 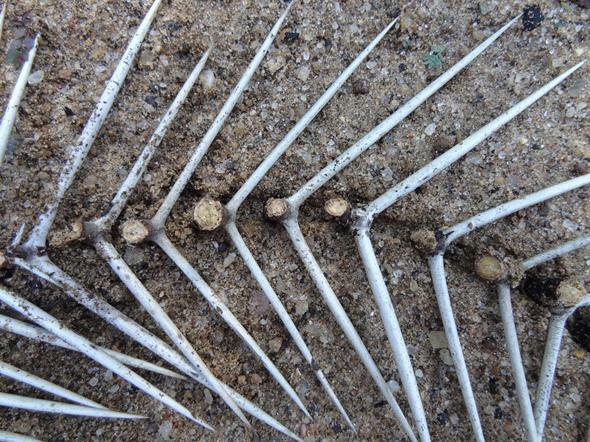 These long, straight, white thorns, growing in pairs at an about 90degree angle to each other, are something I typically relate with Namibia. Different kinds of trees and bushes grow them and they look stunning, but are also really painful if you step into one. 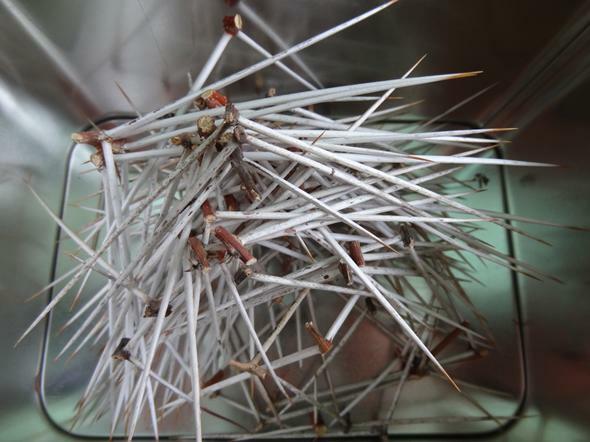 I plan to use many (as in thousands) of these thorns, so I have been spending my past few days cutting these thorns off their branches. 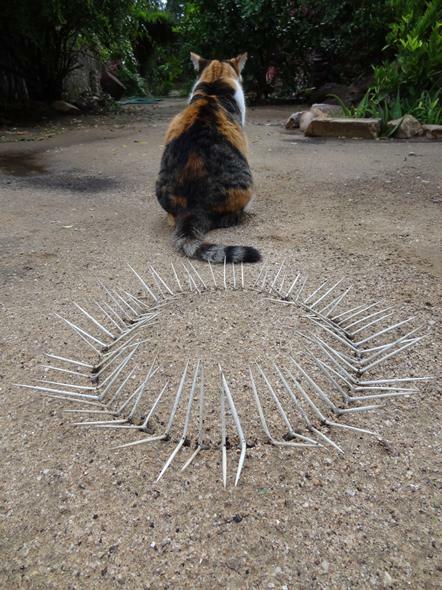 To get a break from this tedious task, I decided to arrange some of the cut thorns in my garden to see what it looks like. I decided on a simple circle shape. And this is what it looked like. Since it was late in the afternoon, I decided to leave the thorns in the garden and wait till the morning to get some of the morning sun for some extra pictures. When I came back to it early in the morning, I realized that some animal walked into the thorns. The circle was damaged and it was surrounded with tracks. 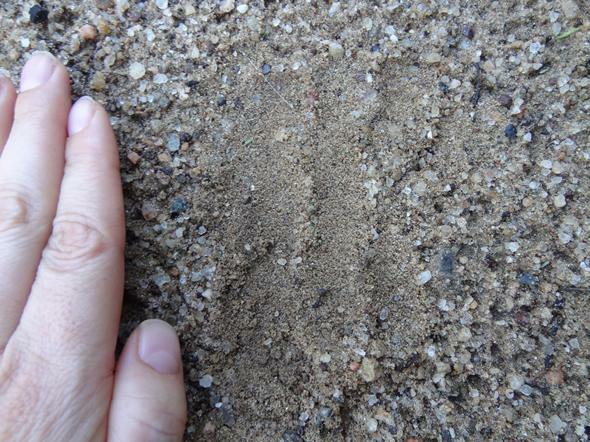 Festus, who sometimes helps me in the garden and whom I called to ask if he could identify the spoor, was not sure what it could be either. But for some reason he thought it might be the perfect time to ask me what the word “Tokoloshe” means. So, maybe it was a Tokoloshe? Hmm, I am still puzzled by what it could have been, but at least I know one thing for sure: whatever it was, it stepped right into the thorns and will surely remember the pain and not come back soon. 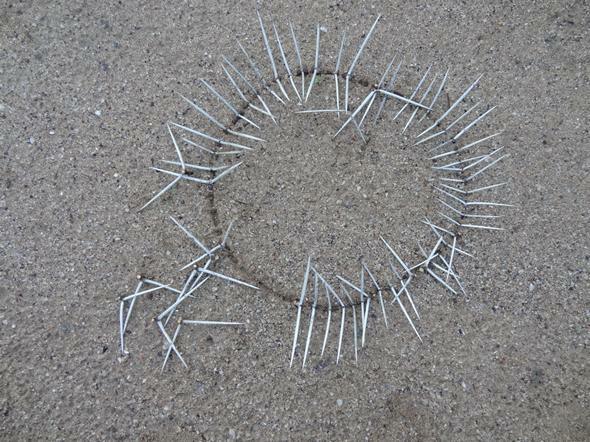 This entry was posted in Installations, Land Art, Thoughts and tagged circle, earth, imke rust, land art, namibia, tokoloshe, trap, White thorns on March 19, 2012 by Imke Rust. Faszinierend und sehr interessant, wie du arbeitest Imke, amazing!!!!!! Ich finde insbesondere das erste Gebilde außerordentlich eindrucksvoll und zugeich zu allen möglichen Assoziationen “bewegend”. Ich könnte mich darin vlerlieren, muss aber zurück zum Tageswerk der mühevollen Versuche, die ebenso “stachligen” wie nach allen Seiten wegstrebenden Gedanken in Form zu bringen. Danke Ute! Ja es ist spannend wie man mit relativ einfachen Mitteln so viele Assoziationen hervorrufen kann. 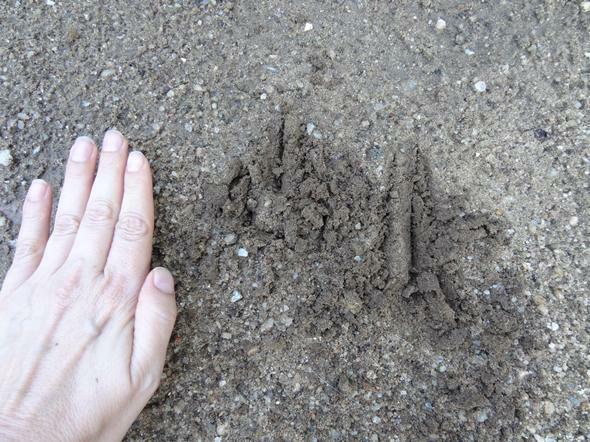 Und fuer mich ist gerade diese From der Kunst (also land art oder nature art) eine gute Art meine Gedanken wieder zu zentrieren und erden, wenn sie durch die taeglichen Dinge zu sehr durcheinander geraten sind oder in alle Richtungen wegstreben. 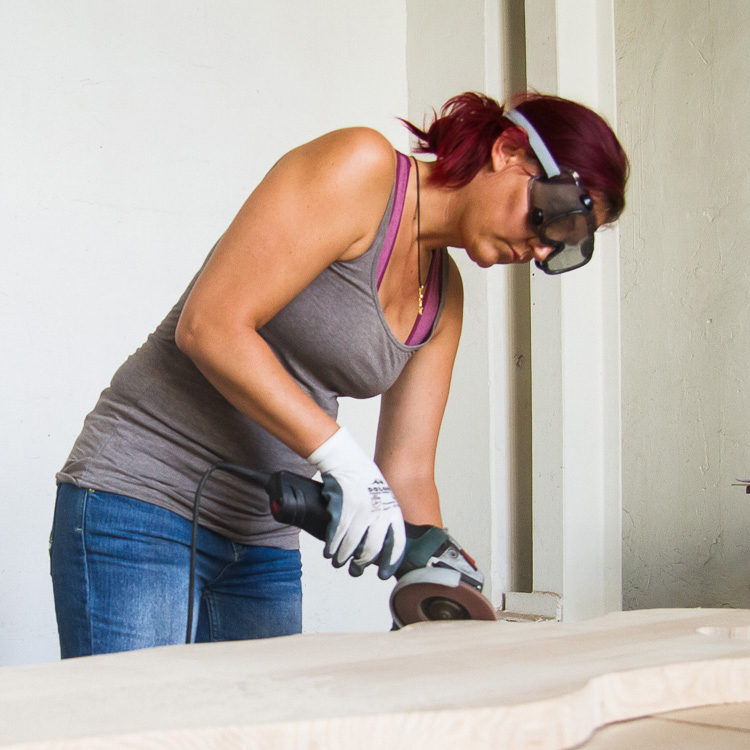 Ich wuensche dir viel Ruhe und Geduld bei deiner Arbeit und vor allem Erfolg! CANT WAIT to see this piece! Thank you Evelyn! Totally agree on the land-art idea. It is so much fun and really special. I have decided to focus much more on that in future. It is also a great way to get earthed and in touch with nature and your soul. Will keep you updated on the progress. 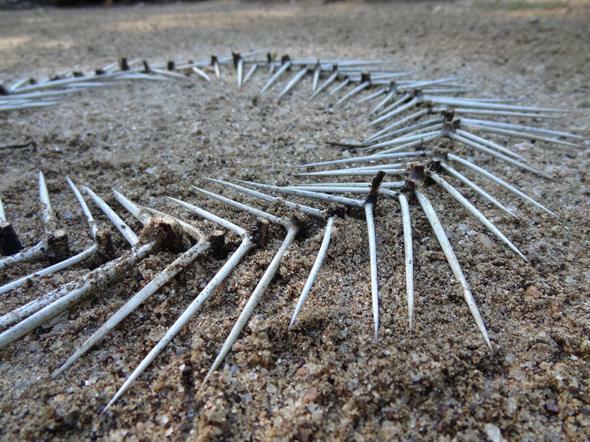 I just watched a Documentary over the weekend, a gentleman worked with ice and flowers and rivers to make his land art. YES! It was so impressive. But it reminded me of you immediately. Amazing, Thank you so much! You have such a talent and it is so exciting to see different kinds of creative outputs working in harmony! Please everybody reading this/my blog, go and have a look at Indigo Spiders link to read what she has made out of it! hahaha! i guess the poor thing choked on the pebbles. Thank you!